My mom-in-law is known for her soul-satisfying Southern cooking. If I lived closer to her, I’d gain a lot of weight but probably be less stressed thanks to all those endorphins she brings to the table. She also has some fascinating stories from her childhood growing up on a farm in the Tennessee countryside during the 1940s and 50s. She’s seen the advent of electricity, indoor plumbing, and automobiles. She’s picked cotton by hand. I had to get all these stories down on paper to save for generations, and why not save those recipes, too. 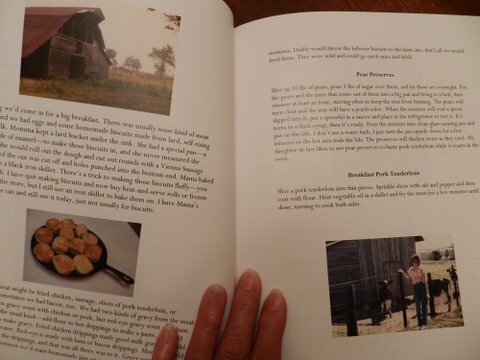 Last summer I published her book of stories and recipes, also photos of food, farm, and even farm crops since most kids these days have no idea what okra flowers or purple-hull pea pods look like. I’m glad my own kids have helped harvest the crops from my in-laws’ current big vegetable gardens. Stooping in the heat and buzzing insects to pull potatoes out of the dirt and snapping a giant pile of green beans to ready them for canning are meaningful life experiences in my books. Don’t take for granted where your food comes from, and appreciate those farm laborers. I had the book printed for family only through Lulu.com since I only needed about 20 copies. Lulu did a fine job on the color interior! I scanned old photos, including some faded b&w ones, at 300 dpi and used high-resolution digital photos taken with my decent-quality Nikon Coolpix. 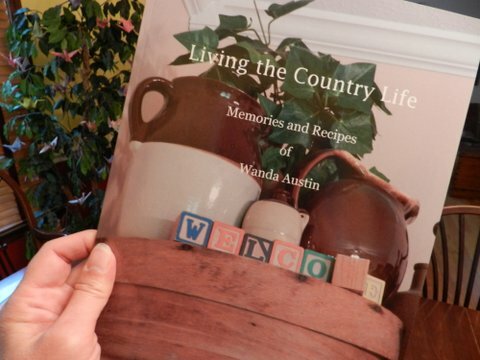 Lulu’s color printing is not meant to make glossy, pro-photography, coffee-table style books or color-illustrated children’s books, but is just fine for family books with smaller size photos or art. The price was right, too. The 36-page paperback, 8.5” x 11” size, was about $18 each. Can’t beat that for color printing. I uploaded a photo taken in my in-laws’ kitchen for the cover and used a free Lulu cover template. Note from my last post, Far-reaching Effects of Family Stories, that Theresa had trouble with Lulu’s printing of her b&w photos. I’ve never had trouble with that before, but that’s something to take into consideration – and always get a print proof copy to head off any problems. 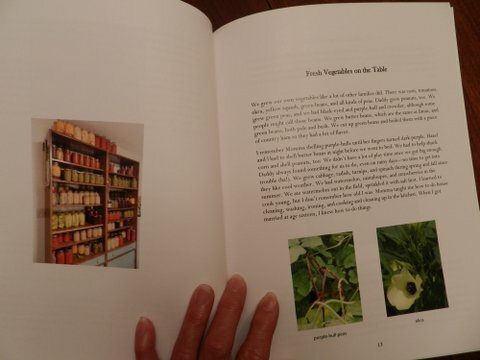 We are thrilled to have Grandma’s cool stories and those recipes saved. Even if we never make some of those rich recipes, they are of historical and cultural interest. Food was a big part of farm life. Homemade boiled custard, mmm. Farming sure has changed over the years. If you’ve got farm stories in your family, write them down to save. Even if you don’t have Grandma’s recipes, you can still write about the food. Tell what you do know and let the younger generations taste it in their hearts and minds. PS: I enjoyed Carol Bodensteiner’s memoir of farm life back in the day, Growing Up Country: Memoir of an Iowa Farm Girl. This entry was posted in capturing memories, grandparents, heritage and tagged culture and heritage, family history, food, grandparents. Bookmark the permalink. I used Lulu seven years ago for my memoir, The Albuquerque Years. I discovered that each publication printer has specific guidelines for best results with pictures, Lulu specified .jpg. I thought some other format required by the printer LIghthouse Point Press used for The Heart and Craft of Lifestory Writing would be better. It wasn’t. When I saw the draft copy, I instantly realized I had to use .jpg format, and it had to be at least 33 dpi. That was for black and white images. I assume it’s the same with color. CreateSpace is lenient about format, but the source image must be saved to the exact dimensions you want it in the finished file. You can’t resize in Word and get good results. Back to Lulu. It may be a good choice for limited edition, one-time books like yours, but when they started playing games with special offers and promotions so I never knew when I’d get the best price, I lost enthusiasm. When they arbitrarily added a royalty when I intended to leave the public price at wholesale, and they and converted my document to a poorly formatted ebook that was listed on Barnes & Noble, Smashwords, IBooks, Kobo and other sites — WITHOUT MY ;PERMISSION — that was the end of any relationship I’ll ever have with Lulu. They did not explain or apologize. I deleted my project and my account. Did you compare cost for the same document on CreateSpace? I’ve heard they also do a fine job of color printing, and their templates are also easy to use. You can order as many copies you as you want as “drafts” without completing publication to list it for sale. Yes, I do NOT recommend using Lulu for public sales, although I think Theresa did since she had people overseas wanting her book. She submitted a pdf (not a Word doc) to lock the file down, which I recommend even for CreateSpace. For public sales, I usually refer people to CreateSpace. I looked at the CreateSpace free templates in 2012 when I published my poetry book through them, but was not able to figure out how to customize them! CS isn’t really meant for making non-public-sales books, but yes, you can load your book files and order books without hitting “publish” which would put it up for sale on Amazon. CS does not offer hard covers, though, and I believe requires your book to have an ISBN, which Lulu does not if you don’t want public sales. Of course, CS will give you a free Amazon ISBN, claiming ownership of your book printed through them – not a big deal for family-only books. People who only intend to write one book, know little about publishing, and just want a few family books will find Lulu a lot easier to understand than CreateSpace. I have seen CS color interiors and they are good, but the paper used is not as good as Lulu’s (slight glossy finish) for color unless you use a premium ($$) printing option. I have not compared their premium price vs Lulu’s standard for color. If anyone else has experience with Lulu printing (not their public sales behavior – beware), I’d like to hear about it. Thank you very much for telling us about your experiences, Sharon. Good to know about Lulu’s paper quality. I have not personally seen color in either format. My most recent Lulu experience was four or five years ago when I did a big project for some cousins. I would have used CreateSpace, but they wanted both hard and softcover copies, and only for family. so Lulu remained the choice. Your experience with both is more recent, and up-to-date experience is the most valid, so I appreciate your expanding the point. The ISBN factor is interesting. I had not thought of it as “claiming ownership,” though I suppose that’s one way of defining their themselves as publisher of record. There could be many reasons for that, but at least one must be the huge discount they get from Bowker for purchasing half a gazillion numbers at a time. For a mere $10 you can mask the CreateSpace ID and acquire a limited use Bowker iSBN listing your choice of publisher name. That publisher name is registered with Bowker, not Amazon, but it’s only for use with CreateSpace. If you want a full-featured ISBN, Amazon will sell you one for a considerable discount over going directly to Bowker. Last time I looked that was $99, for use anywhere. Bowker was more than $20 higher for a single number. A ten-pack from Bowker is a much better deal if you plan to publish several titles. Yes, for family-only books, Lulu.com is probably still best because it’s very easy to manage, no need to bother with ISBNs or know anything about the business of publishing, and not expensive if you don’t start hiring them for other services. Lulu will also do books with very few pages, as little as 24, although those need to be hardcover. For those authors who are serious about wanting to write and sell books and be a publisher, I have in depth articles on CreateSpace and Lightning Source/Ingram Spark under the Resources tab. By the way, Lulu does not pay me to say anything nice about them! Ummm! Southern cooking!!! Definitely endorphin time! Writing of her recipes was a wonderful idea. Now her descendants will be able to enjoy what you were able experience. The additional info on Lulu and CS was helpful, too.